“Jumping the shark” is the worst nightmare of every product person. Often, SaaS companies go through a quick growth period followed by a sudden turn in fortunes that they never manage to overcome. Plotted on a graph, it looks a lot like the back fin of a shark. After you launch your product or feature, you see a sudden sharp spike in acquisition—maybe you hit the front page of Product Hunt or someone from TechCrunch discovered your product, fell in love with it, and decided to write about it. You get optimistic—you're seeing a high volume of sign-ups every day. It feels like you've hit the magic formula for growth. But then things quickly turn around. Signups taper off, and you begin to realize that the people who signed up in the past don't stick around. Аs you acquire more users, the pool of available new users shrinks and acquisition gets harder and harder. Soon growth starts slowing, and suddenly it takes a nosedive. The reason so many companies end up in the dip of the shark fin is that they aren't looking at the numbers that really matter. Signups on their own can be a vanity metric—it gives you a good feeling, but it doesn't necessarily signify success in generating loyal customers. In order to grow, teams have to acquire and engage people who will actually use the product and stick around. If you're running a software product, you have to think carefully about defining what makes a user “engaged.” You need to find out what leads to long-term retention and, ultimately, growth, and track the rate of people who keep using your product after signing up. Let's break down how measuring engagement rate will help you build a company that's set up for long-term success. How do you define—and measure—engagement rate? At its most basic, engagement rate is the percentage of users in a particular cohort who remain active over a defined period of time. Measuring the proportion of users who are truly engaged after signing up gives you a good basis to understand the performance of your product. This understanding can warn you of potential dangers long before you reach the downward slope of the shark fin. 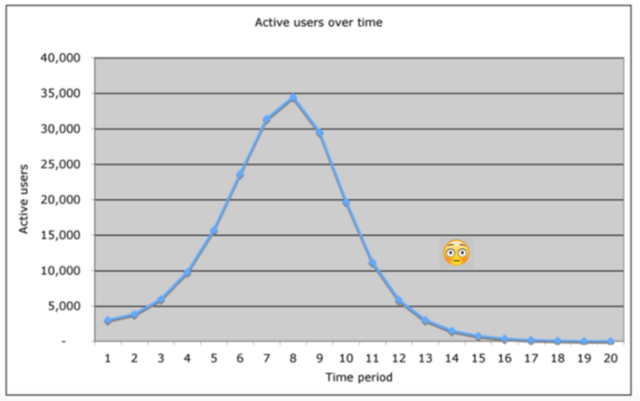 Measuring your engagement rate essentially comes down to tracking the number of users who are active in your app over a certain period—usually a day, a week, or a month—as a proportion of everyone who signed up during that same period. The main challenge with this measurement is how you define an active user—it could be something as simple as a customer logging in, but does that really represent a person who has strong motivation to use your product? "Engagement is when your customer is realizing value..."
Therefore, the engagement of your product is tightly related to its “Aha moments.” Pinning down engagement allows you to isolate the moments of value-discovery and help you activate users during onboarding. There are many different ways to measure engagement rate. Engagement by month, week, and day: Which gives you an overview of whether your product is succeeding in creating loyal users over time. Engagement by channel: Which informs how productive each side of your acquisition activity is and helps you focus on the channels that yield the best customers for your product. Engagement by feature: Which helps you understand what users value and guides your product development efforts. Understanding and optimizing engagement in different ways can guide you in every aspect of your business—how well you're doing at keeping users, where you look for clients, and what you build. It can also help you retain more users and build a strong customer base to support growth. DAU: Or Daily active users, tracks the total number of users who use your product on a daily basis. It is a useful metric for consumer products with a high volume of activity where users log in every day like Facebook or Snapchat. WAU: Or Weekly active users, seems to be the preferred method of most SaaS products to track engagement because it removes much of the variability that's typical in DAU, such as weekend dips. Most tools, especially in B2B, are not used every day, so WAU is a much more relevant way to track engagement. MAU: Or monthly active users, is a good option for tools that are used only a few times each month. Additionally, MAU can serve to track the long-term retention of cohorts of users. None of these ways to measure engagement is inherently better than the other. To choose the best one for your product, you have to look at the unique context you operate in and pick the metric that makes the most sense to the cycle in which people use your solution. Looking at the engagement levels of customers over time helps you track your performance but doesn't explain what makes some users a better fit than others. That's why it's also important to understand how the channels through which you acquire users affect engagement and retention. ‍Referrals: New customers sign up after being invited by an existing user of your product. Direct conversions: People convert on your website after finding it organically or from a link in a guest blog post, ProductHunt, etc. Lead nurturing campaigns: You nurture and educate leads with drip email sequences, white papers, and other resources. Group the users from each of these channels into a dedicated cohort, and analyze the engagement rate of each on a weekly or monthly basis to discover which channel produces the most long-term users. For example, if you find that referrals are a source of high-quality users, you can confidently focus your resources on referral marketing at the expense of other, less productive channels. Measuring your app's engagement rate across time periods and channels gives you a big picture overview of how your product is doing. But you also need a magnifying glass that helps you understand why users love your product—that's when the engagement rate of each feature comes to play. Looking at how each feature of your product affects engagement can also guide your product development efforts, helping you build the features that your target audience needs. Feature analysis will make sure you take the right product initiatives and understand what improvements will drive higher usage over time. To measure engagement rate by feature pick the elements you think are most important or the 2-3 most recent features you built. Calculate engagement rate as the percentage of monthly—or daily, or weekly—active users that use that feature and compare to the overall engagement rate of your product. 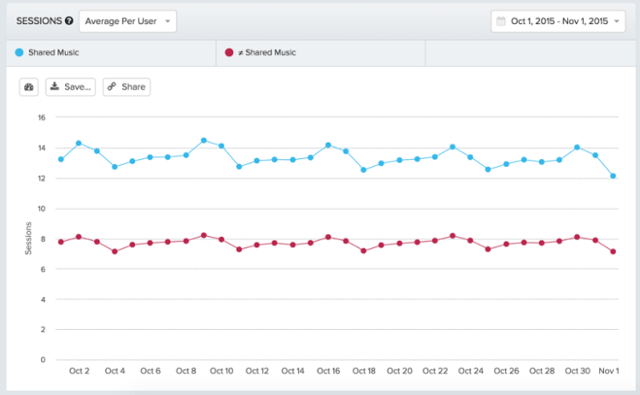 In this example we clearly see that sharing music leads to significantly higher engagement and retention rates. However, that won't be the case for every feature in your product. Don't be afraid to drop your assumptions when you discover that a feature that you thought was critical hardly gets used. Measuring feature-specific engagement rates is a great tool that can guide your product development efforts. 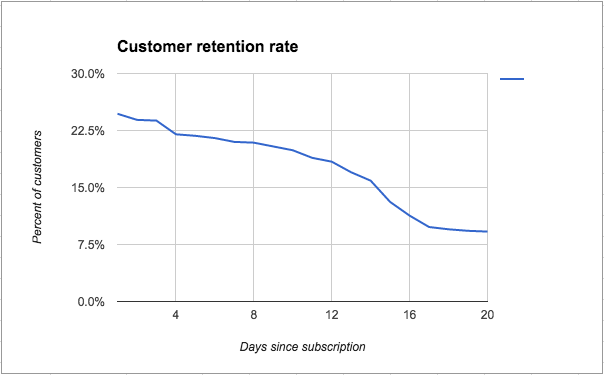 Retention is the true marker of success, and user engagement is the lever that drives customer loyalty over time. When measured correctly, engagement rate can give you great insights into the behavior of your customers and indicate things like which customers are the best fit for your app and what you need to build to solve their pains even better. You'll never build a successful software company without getting users to stick around in the long run. So you first need to understand what engages them and why, and then start improving in that direction.